New York, January 9, 2006 -- The Week of Prayer for Christian Unity, a bellwether of the ecumenical movement since 1908, will be celebrated across the globe January 18-25, 2006. The week of prayer, which has inspired members of most Christian traditions for 98 years, will be observed in ecumenical councils, communion headquarters, dioceses and local congregations in both hemispheres. The theme of this year's observance is, "Where two or three are gathered in my name," invoking Jesus' promise in Matthew 18:20 that when Christians gather, "I am there among them." Resources for Christian Unity worship services and other activities can be obtained from the Graymoor Ecumenical and Interreligious Institute, 475 Riverside Drive, New York, N.Y., 212-870-2330. The theme and text for each year’s observance of the Week of Prayer are chosen and prepared by representatives of the Pontifical Council for Promoting Christian Unity and representatives of the World Council of Churches. The international texts are developed, adapted and published for use in the USA by Graymoor. The Faith and Order Commission of the National Council of Churches USA promotes the week among the NCC's 35 member communions. According to Sister Lorelei F. Fuchs, S.A., associate director of the Graymoor Institute, the annual Week of Prayer for Christian Unity began in the Episcopal Church in 1908 at Graymoor, in New York’s Hudson Valley. Ten years earlier Paul James Wattson, a priest of the Episcopal Church, co-founded the Franciscan religious congregations comprising the Society of the Atonement at Graymoor with Lurana Mary White, also an Episcopalian.Wattson was a vigorous advocate of Anglican and Roman Catholic reunion, and he emphasized the role of the papacy in the reunion of Christians. With the Second Vatican Council, 1962-1965, Sister Lorelei reports, an increasing number of Roman Catholics joined other Christians each year in January for common prayer for unity. The council’s Decree on Ecumenism, promulgated in 1964, called prayer the soul of the ecumenical movement and encouraged the observance of what is now known as the Week of Prayer for Christian Unity. In 1966, the Faith and Order Commission of the World Council of Churches and the Vatican Secretariat (now Council) for Promoting Christian Unity began collaborating on a common international text for worldwide usage. Since 1968 these international texts, which are based on themes proposed by ecumenical groups throughout the world, have been developed, adapted and published for use in the United States Graymoor. To assist in this endeavor, the GEII invites contributions from ecumenists and church leaders in America. In 1983, the National Council of Churches’ Governing Board urged their member communions to designate an "Ecumenical Sunday" for prayer for Christian unity. Eventually, conversations among organizers of the Week of Prayer and representatives of the NCC and local councils led to placing Ecumenical Sunday within the Week of Prayer context. 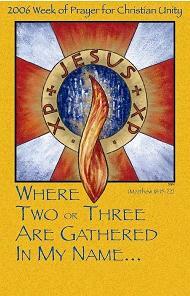 The full text of Sister Lorelei's history of the Week of Prayer for Christian Unity is here. The history in Spanish is here.